Thomas Spratt, age 92, passed away peacefully on March 26, 2019.
and Jacqueline. He attended Lawrence Technical school at night in pursuit of a career change and received a bachelor degree in 1954. After completing his college studies he worked as a designer for Ford designing European cars and then for the defense resource division of General Motors. Thomas had many interests and talents. He learned the game of football (soccer) at a young age and played on many teams. He was a loyal supporter of the Glasgow Rangers football team. 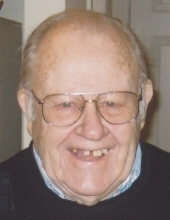 As a lover of music, Thomas played the piano and accordion. He often partook in many sing a longs and was very active in the White Heather and Commonwealth Clubs. At one point he hosted the Flying Scots radio show out of Leamington, Ontario, playing Scottish music and reciting poetry. He was an avid reader, enjoyed trivia and doing crosswords. He was extremely proud of his strong Scottish roots, and he would take his family to visit the country he held so dear to his heart. Thomas also enjoyed dancing, golfing, and tennis. Thomas was a life long member of the Masons lodge 152 (becoming a member in 1957), as well as a member of the Shriners. Thomas was a Scottish treasure and he will be forever missed. Beloved father of Diane (Mark) Clark, Elizabeth (Kenneth) Kolp, Sharon (David) Rymsza, and Jacqueline (Michael) Basone; cherished grandfather of Kristie (Robert), Melissa, Lauren (Ruis), Michael, Ian, Megan, Jamie (Blake), and Amber; dearest great-grandfather of Austin, Kyle, Cora, Isla, and Gabriel. Loving uncle to many nieces and nephews. Preceded in death by his loving wife Adele Spratt; and dear parents John and Elizabeth Spratt. Visitation will be on Monday, April 1st from 2-9PM at Lee-Ellena Funeral Home. Mason Memorial Service at 7PM. Funeral Service on Tuesday, April 2nd at the funeral home. Instate, or gathering time, 10:00 AM. Service at 11:00 AM. Procession to Cadillac Memorial Gardens East to follow. Memorial Donations may be made to the Alzheimer's Foundation of America. To send flowers or a remembrance gift to the family of Thomas Spratt, please visit our Tribute Store. Instate, or gathering time, 10:00 AM. "Email Address" would like to share the life celebration of Thomas Spratt. Click on the "link" to go to share a favorite memory or leave a condolence message for the family.